A couple of weeks ago I posted a photo with Tim Frick and Mike Frogley. 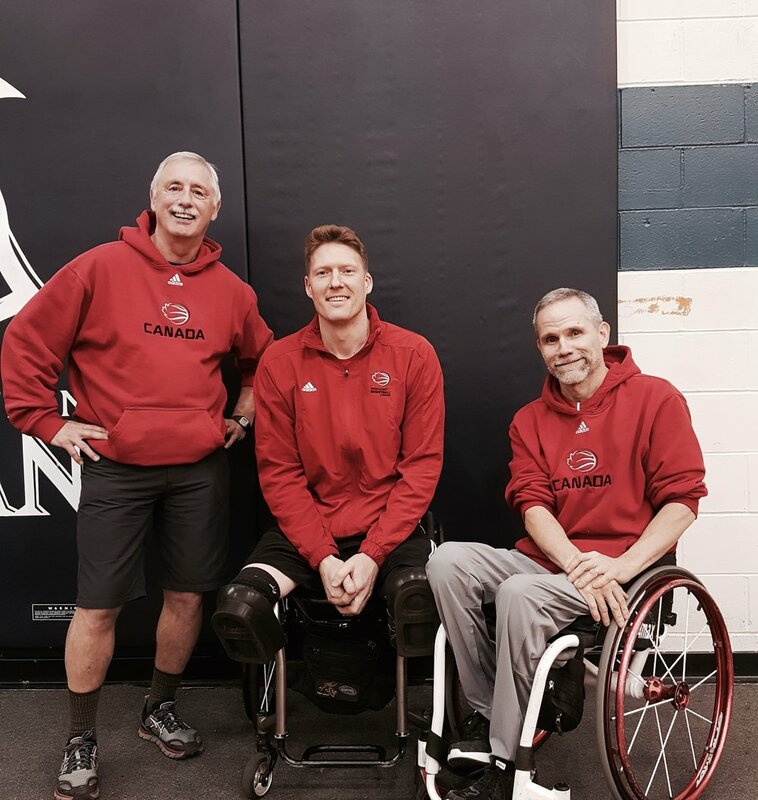 If you know wheelchair basketball, and particularly the history of wheelchair basketball in Canada, you know these gentlemen. They are coaches with gold medal pedigrees that would make Phil Jackson blush, if you can imagine such a thing. In the caption to the photo, I referred to Tim and Frog as the yin and yang of gold medal coaching. In other words, they achieved the same result but took very different paths to get there. Frog taught by using strict discipline and laser focused planning to set the conditions for maximum effort all of the time, but somehow also fostered a creative workshop mentality. Sort of a military commander with a twinkle in his eye. I never played for Tim, so I can only describe his approach anecdotally. Here’s one story. We were at a training camp at Variety Village in Toronto, late 90’s or early 2000’s. Both the women and men were there. One day we noticed the women carrying pillows around the facility. Later in the gym, we learned why. During their practice time, Tim instructed the women to lie down on the court with the their pillows and led them in a visualization exercise. All we could do was laugh, not in ridicule, but at the thought of Frog using his limited allotment of court time in this fashion. You might as well imagine giving a starving dog a steak and asking him to let it marinade for an hour before eating it. In the winter of 2002, I drove out to BC to spend some time in God’s country, and to hang out and train with teammates Kenny, Jaimie, and Bear and the local Vancouver guys. I showed up to my first group training session led by Tim, and fell into friendly banter and conversation as one does with Tim. At some point, he casually mentioned that taping one’s wrist had been found to reduce wrist pain associated with pushing a wheelchair. He had everyone in BC doing it. Wonderful, I said. Whatever works for you guys. Let’s play ball. That’s when I learned that a casual suggestion from Tim was a little more than that. After a couple more friendly suggestions, I slowly realized that it was in fact required that I tape my wrist in order to practice with them. Having come off a gold medal in Sydney, and carrying myself like a made man who could handle my own taping decisions, I was not exactly disposed to taking orders, no matter what his pedigree was. But a couple minutes later, I found myself wheeling around the gym with tape on my wrists. I caught a glimpse of a coach who might bend, but would not break. Here’s one more story, from Tim himself just a couple of weeks ago. We were chatting between practices, along with Frog, and Tim told us that one of his primary strategies at the 2000 Games was sleep. Just sleep. Get more sleep than the other teams. Apparently, there is a 7% increase in traffic accidents the day after daylight savings goes into effect. So rough math: 1 hour less sleep = 7% decrease in performance. Armed with this insight, along with the reasonable assumption that the arch-rival Aussies would be busy as Games hosts, talking to media, arranging tickets for friends and family etc, Tim decided that simply sleeping more would improve their chances of winning. So he cancelled all their morning practices. I looked at Frog and he just laughed. He had a slightly different task at those Games, he explained; burn off excess energy. It is true that we were a young team, bursting at the seams with energy and personality. Our week-long training camp in Adelaide before we moved into the Paralympic village was one of the most physically and emotionally frenetic camps I can remember. It was an all-out sprint to the finish. And Frog held the whip. But hey, both approaches worked. The women won gold, we won gold. Hard to argue. Speaking of glimpses, that's all I’m giving here. There’s so much more to Tim and Frog as men and coaches. But to me they’ve always stood for the truth that there’s more than one way to…fill in the blank. All-time greats - both of them.